As a librarian, I’m naturally a bit obsessed with reference books, and in particular, horror reference books. When I was too young to see horror movies, I could still read books about them, and based on the plot description I would let my imagination do the work. For a good number of movies, I’m sure the dread-filled images in my head were better than the actual movies turned out to be.So with that in mind, I’m always on the lookout for new books about horror movies. And who doesn’t love a good list book? 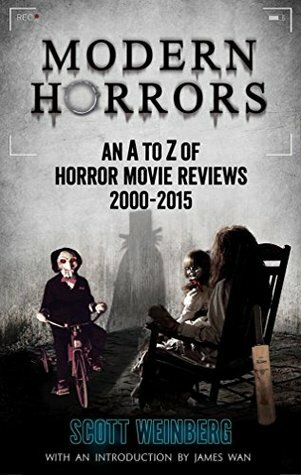 My personal preference for horror is anything from the eighties, so I’m branching out to see what I can discover with Modern Horrors: An A-Z of Horror Movie Reviews 2000-2015 by Scott Weinberg. For those not familiar, Scott Weinberg is a well established film critic writing for numerous websites. This book is an A-Z list of over 800 horror movies that were released in 2000 or later. First of all, that’s a lot of films covered. It’s a mix of independents, big budget offerings, and U.S. and international releases. The reviews are at least one page long, so you’re getting more than a peripheral examination of each title, with some of the more interesting films earning longer discussions.The author has very strong opinions. He’s a critic; that’s his job. There are always going to be reviews that I don’t agree with. How much you enjoy a movie is a matter of taste and everyone is entitled to an opinion, so I don’t get up in arms if a movie that is horribly reviewed is one that I love. Weinberg is passionate and entertaining throughout and there is a good bit of humor, especially when covering the movies he clearly thinks are terrible. I feel the pain he must have gone through when watching terrible movies like I Know Who Killed Me and The Scorned. The reviews are never dry. For example, the opening to his Book of Shadows: Blair Witch 2:If “earth-shatteringly dull” is a term you like your horror movies described as, Blair Witch 2 is for you.I don’t want to give the impression that the book is full of negativity, as that is not the case. The movies he likes, he likes (even if horror snobs would consider them unfashionable). I really enjoyed the focus of the book. There are lots of gems from the past 15 years that I now know I need to catch up on. It’s also a look at where horror has been and where it’s going, with nods to the reassuringly excellent films that have come out over the last 15 years, such as 28 Days Later, Dead Snow, It Follows, and The Babadook to name a few. Thankfully with these recent-ish movies, there’s a good chance you’ll find them on a streaming service. If I had one criticism – well, suggestion for improvement really – it would be to add some images or posters. The book is entirely text. What you’re getting with this book is a thorough guide that’s a joy to flip through and a useful companion when browsing Netflix. Stellar, comprehensive study of one of the most vital periods in horror. An exhaustive compendium of Weinberg's reviews from 2000-2015 that will likely serve most usefully as a reference text when searching for hidden gems in the glut of modern horror films. As is to be expected (and as I'm likely guilty of myself), there's some repetitiveness to the language in his reviews, and certain tics (like inevitably singling out every attractive actress as easy on the eyes) can be frustrating, there's no denying that the man knows and loves the horror genre. What I found most interesting was discovering he'd trashed certain films and filmmakers I happen to be a fan of - specifically Rob Zombie. It's interesting to see what aspects of a film or tendencies of a filmmaker can eternally sour someone on their work. Again, you probably already know if this is something you're interested in. It's a rock solid compendium of reviews that should serve as a handy guide for anyone new to the genre, and a welcome reminder to long-time genre hounds that there's always more to discover. Excellent listing for horror film buffs. I found dozens of titles that I added to my list of "must-see" movies. The book quite extensively covers the last 15 years, and it was fun to be reminded of some smaller, more indie titles that I remembered enjoying a few years ago. Was kind of surprised by some of the films included, like Jurassic World, which I don't really consider to be a horror movie, and surprised by some of the titles that were omitted (Zombie Strippers not included! What!? ).While the big-budget Hollywood titles are included in here, most of the films he reviews would be considered "indie," so if you like searching through the indie horrors to find those hidden gems, this is an excellent tool to help you find some.I can't say I agreed with him on all his reviews (for instance, I kind of liked Boogeyman, but he rips it apart! ), however, most reviews have a good enough description of the film that you'll know if you want to give the movie a try anyway.You'll notice (because it will be mentioned often) that the author has a special place in his heart for found-footage films (me, too!) and cheesy, SyFy monster movies (yuck! ), so that should give you an idea of where he's coming from. He also has a tendency (kind of by his own admission) to give the extremely low budget movies more slack than most of them probably deserve. Also, (just a nit) you'll find his reviews riddled with (parantheses) when commas would have done just fine (which I am obviously mocking in my review here)! Not a big deal, just kind of funny!I highly recommend this book. Just make sure you have access to your streaming service queu of choice so you can add on titles as you find them. It took forever to read the book because of that, but totally worth it!